I spent today in Seattle at Century Link Field. 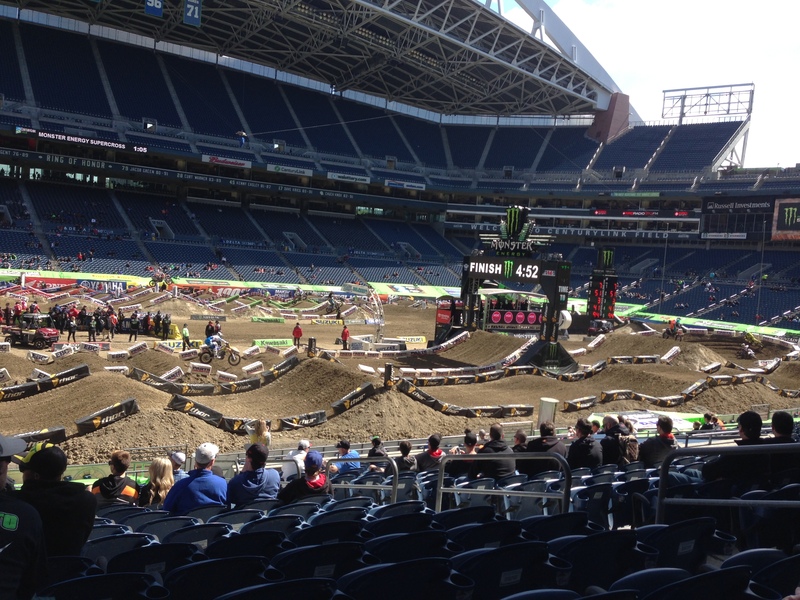 Monster Energy Supercross made its annual stop in the Pacific Northwest, and it couldn’t have been a more beautiful day. 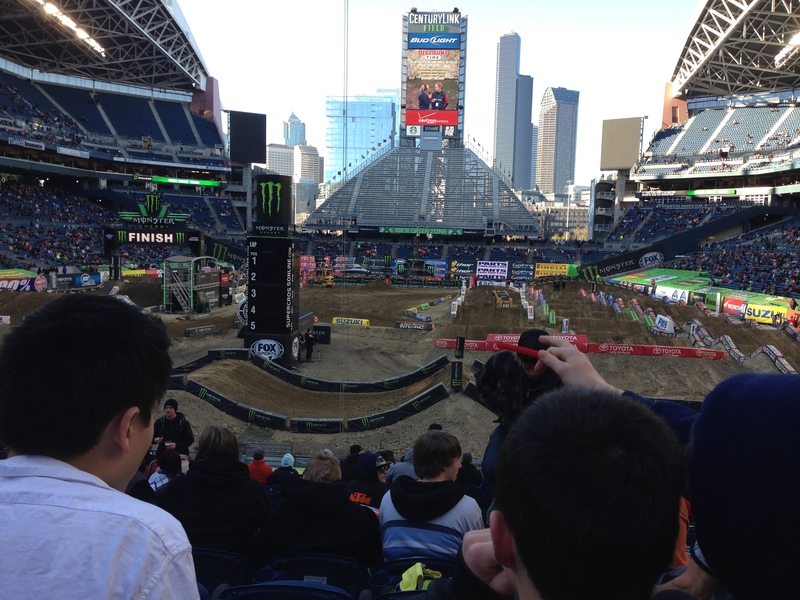 The supercross series consists of 17 dirt bike races held in football and baseball stadiums around the country. Hundreds of truckloads of dirt are brought in and a track consisting of massive jumps and banked turns is created to test the best racers in the world. My view for afternoon practice. My seats for the night show. Over the past few years I’ve taken notice of all the promoting and advertising that goes on for these events, and the amount of PR tasks is huge! Press day takes place late in the week leading up to each weekend’s race, and this is where the local media get a glimpse of what is in store for the weekend. Press releases are sent out to local news stations weeks in advance, and this usually leads to riders being featured on these news stations and in local papers. These kinds of things are done to get people interested in the event. The majority of the series only stops in each city once, so the promoters only have one shot to sell as many tickets as they can. Usually news stations will create stories about local riders to spark interest in those who aren’t familiar with the sport. For instance, this past week, Oregon native and team Pro Circuit Kawasaki rider Justin Hill was featured on Northwest Cable News. I love how PR tactics such as press releases, interviews and social media are applied to so many different kinds of events. It’s one of the things that makes studying PR so enjoyable for me. 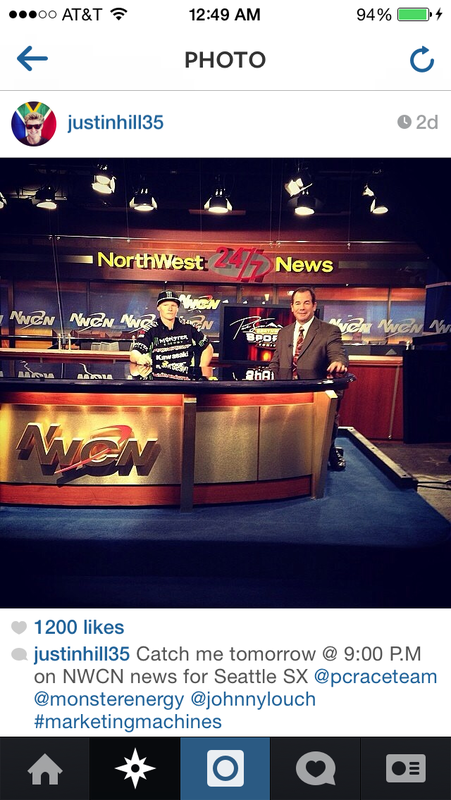 Justin Hill sharing his interview on NWCN via his Instagram account. Next Next post: People Don’t Believe Everything They See on Facebook? Who Knew.